A recipe for any leftovers this Christmas. 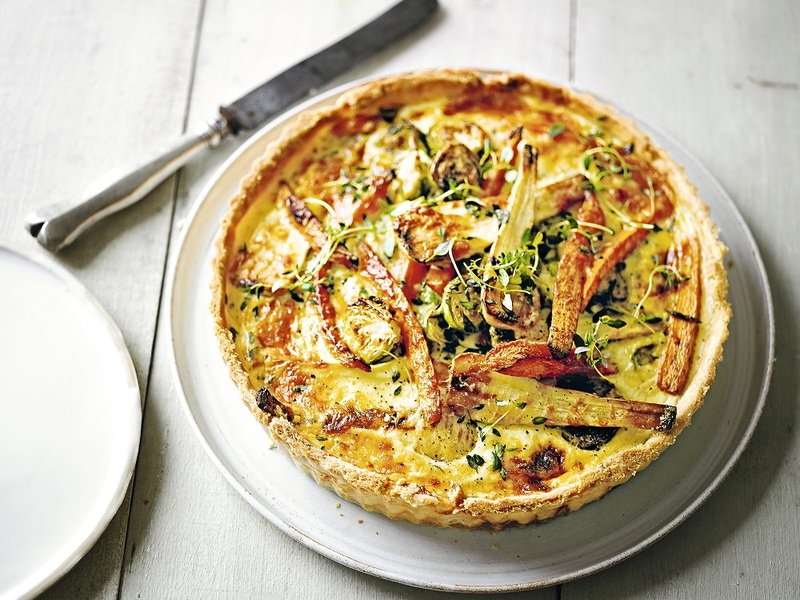 A versatile tart that will work with whatever veg you have left over from the big day. This also works well with any firm or semi-soft cheese, including goat’s and blue cheese. 1. Preheat the oven to 180˚C, gas mark 4. Roll the pastry on a floured surface to the thickness of a £1 coin. Place a 23cm x 4cm loose-bottomed tart tin on a baking sheet and line with the pastry, pressing it right into the corners. Leave the edges overhanging, prick the base and chill for 20 minutes. 2. Line the rested pastry case with parchment and baking beans. Bake for 20-25 minutes until the edges are golden brown. Remove the baking beans and cook for a further 10 minutes or until the base is a light golden colour. Cool for a few minutes then use a serrated knife to trim off the overhanging pastry. 3. Fill the pastry case with the leftover veggies and most of the cheese. Whisk the eggs, cream, milk and thyme leaves together until smooth, season well and pour in the tart case. Scatter over the remaining cheese and bake for a final 30-35 minutes, or until just set in the middle. Cool for 5 minutes, remove from the tin and then transfer to a cooling rack. Serve at room temperature or chilled with some mixed leaves. Christmas Leftover Veg Tart Recipe courtesy of Waitrose. What do you think of this Christmas Leftover Veg Tart recipe? Cheeseboard Mac And Cheese: Nice And Filling Dinner. Turkey, Gammon & Sprout Pot Pie. Why not try now or pin for Christmas? "Bring On The Party Season In Style: Christmas Fashion"
"Cheeseboard Mac And Cheese: Nice And Filling Dinner"
Pinned! YUM!I would love for you to share this with my Facebook Group for recipes, crafts, tips, and tricks: https://www.facebook.com/groups/pluckyrecipescraftstips/ Thanks for joining Cooking and Crafting with J & J!